HEALING AND MARTIAL ARTS BLOG » Blog Archive » WHAT IS MIND? This article goes a long way to clarify something that has always puzzled me. It still though, leaves much to be discussed. One of the many things that the TCC instuctors profess is the end of dichotomy between mind and body, the discovery of a forgotten and all-wise mechanism of dealing with the environment (the “second brain”, the “inner self”, the unconsciousness which becomes conscious etc). But the TCC axiom is clear: The mind should lead the body. What kind of Zen is this, where a person which has labored for years in order to reach a state of “no mind” should revive the mind instead of leaving the body “just do it”? Or is it maybe that we have placed too much attention into the form and every kind of self observation, self and body awareness and meditation, that we are left with a rather passive mind which in the end becomes slower than the body itself? Your confusion may become clearer by understanding that the Tai-chi mind is not thinking. It is the consciousness of the body itself. We have isolated ourselves in such a way that the only consciousness most people are aware of is thinking. But thinking is a tiny mechanism based on isolation. The “mind” or “attention” of Tai-chi is that which connects all living things. It has dynamics and qualities. It is in dynamic equilibrium in a natural state. 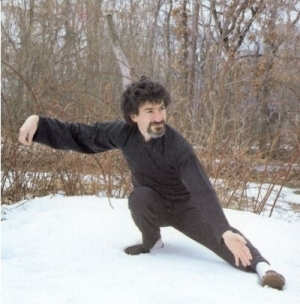 The exercises of Tai-chi are designed to bring us back to that natural state in which our identity is in the connected, natural mind rather than in the calculating mind.